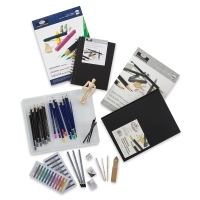 Learn more about different art media and techniques with this affordable selection of sketching and drawing materials. 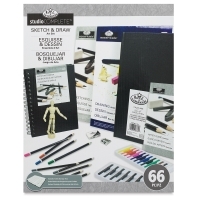 The 66-piece set includes colored and graphite pencils, compressed color sticks, sketching sticks, charcoal, drawing/sketching pads/books, a guidebook, a mannequin, and other essential accessories. ® Royal & Langnickel is a registered trademark.™ Studio Complete is a trademark.